When it comes to the bathroom, there are certain basics that can't be eliminated -- namely, a tub or tub/shower combo, a sink and a toilet. Those are the non-negotiable necessities. But that doesn't mean that you can't choose them with an eye towards saving space. Also remember that when it comes to locating the toilet, you'll need room to manoeuvre a little, so allow some space, especially in front of the toilet, for comfort's sake. Installing a wall-hung toilet is another way to free up a little extra space. For a wide variety of trendy and practical bathroom fittings in Melbourne, be sure to check out the offerings at Cook & Bathe! You may be able to cram a lot of "stuff" into a small space, but is that really wise? You don't want to be hitting your elbow on the edge of a vanity every time you dry yourself or apply a body moisturiser. You need a little room just for bending over and moving around. Part of how comfortable you'll feel in a small bathroom has to do with how small it actually feels. You can visually enlarge the space through the use of mirrors, plenty of natural and artificial light, and by sticking to a fairly monochromatic colour scheme. Mirrors are a time-tested trick designers use to make any small space feel larger, and a large one over the sink area is advised. You can even extend them along an entire wall if you like. Light also has a way of reflecting off of mirrors and light-coloured surfaces to make a room seem larger and hairier than it actually is. If your bathroom is landlocked or just doesn't have a window, consider using solar tubes or a skylight to bring in a bit of natural light. 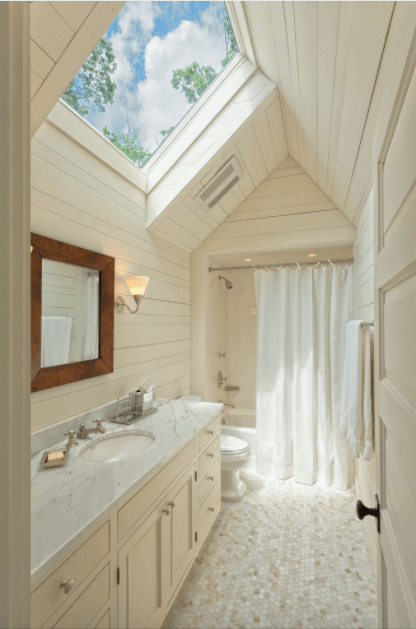 Finally, try to keep the floor, walls and ceiling all the same tones, which will visually enlarge your bathroom. You could tile the floor and walls right to the ceiling, or tile the floor and paint the walls in a variation of the same tone. Even the ceiling can be painted to coordinate with the walls by simply using the same tone in a slightly lighter shade. Ideally, you've included a small linen closet in your bathroom design for essential bathroom supplies, but even if your space constraints don't allow you that luxury, you can use the vertical space in the room to install shelves, built-in niches, wall-mounted baskets and hooks to accommodate bathroom essentials like towels, cleaning supplies, toilet paper and toiletries so that they're organised and accessible. A small bathroom may be your reality, but it can also be your triumph with a little prudent planning, imagination and creativity!